this is some crazy funky old school belgian weirdness, in a good way. have yet to be real impressed by their beer, but this one certainly takes the unique cake. ugly old pour on it, hazy brass color with all kinds of sediment, not just yeast chunks but black stringy pieces that m,ay be parts of a barrel, and a lot of white fuzzy stuff in the dregs. nice white head though, and visible carbonation. it smells funky, sour, and grain heavy. usually sour beers this color are so sour and yeasty that the malt is almost irrelevant. not in this beer, the grain dominates the smell and the taste, especially in the finish, which is cheerios or chez or some other sort of healthy simple low sugar cereal. there is a good mix of lactic acid sourness and farm yeasty funk, its a well balanced mix of all these strange flavors, and even a red apple hit for just a second before the long sour finish. its not too sour though, i can taste it all the way through, enjoying the malt and appreciating the yeast. it also has the odd property of being both refreshing and filling. small doses suffice for me with this one. bubbly with a mellowness from the wood. one of a kind beer, old world belgium style, it feels like a relic of past brewing traditions, and i like it for that. the best I've had from hot ten dormaal i think. Stepping out of the Senne Valley and Brussels landscape and into the Tildonk region the Hof ten Dormaal brewers demonstrate the vastly "wild" flavors that exist all over Belgium. 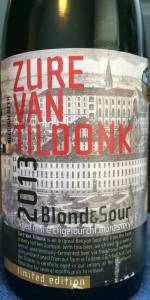 Zure Van Tildonk pours with a striking lemony pour, pale yellow in color. Casting a strong cloudy haze, a dainty cotton-white creme swirls above and emits a kaleidoscope of aroma. Bright with dried lemon and lime, an acute citric acidity strikes the nose and evokes mouth whetting. With a backdrop of whole wheat bread and candied sweetness the early palate is soft and delicate even as cork must, vinous white wine, weathered wood and attic-like aromas swirl above. Intensifying sourness soon overtakes the lingering starch and confectioner's sweetness and the lemon and lime sour-bitter interplay seeps deeply into the tastebuds with its tangy fruit. Lightly of brine and sea salt, crabapple, under-ripened berry weave with the mustiness of leather, drunken vinous oak and dry cider. Its beautiful finish remains salty, bitter and sour even as supporting malt offers balance even late. Lacking the full mustiness of unblended lambic from Brussels, the dryly piquant citric sourness leaves the palate clean and refreshed, more like stronger flavored Berlinerweiss. A: Small bright white head that quickly dissipated away with a fizzy sound. A small ring of bubbles is left on the edge of the micro snifter. Golden yellow color with a mild to moderate haze and a constant stream of bubbles coming up from the bottom of the glass. S: Moderate level of sourness in the nose, no vinegar or nail polish, very crisp. Mild level of pleasant funky brett aroma - the barnyard, horse hair, rustic character. A light fruity impression comes through also. T: Moderately tart sourness with slight funk. Very low bready malt taste hiding underneath. The sourness has a slight citrus fruit vibe with lemons and orange that has an impression of sweetness. No hop character or alcohol. M: elevated levels of carbonation that give it a spritsy refreshing finish. Very dry finish too. The tartness hits in the cheeks and the roof of the mouth giving a slight tingling sensation. O: A refreshing, tart lambic with a slight fruity character. No harshness just a pleasant beer with a nice funky undertone. Pale yellow bottle pour has no visible carbonation. Aroma is is limes and Brett. The flavor is mildly tart with grape and oak notes. This is a quite palatable unblended lambic. The mouthfeel is very wet for the style. 12.7 oz C&C green bottle poured into a Bruery tulip. Best by 2017-12. Appearance: Pours a cap of thin almost clear head that quickly fizzes away to a ring. Hazy gold body. Aroma: Up front white wine, lemon juice, strawberry yogurt, musty grains, gravel and toasted oak barrel. Taste: Lemon juice and a sweet, fruity yougurt tang, tart white wine leading into some musty Brett and an almost bitter dry oak barrel. Toasted grain (wheat) finish. Mf: Lots of prickly carbonation which really brings out the sour in first few sips. Not too acidic though and very drinkable. Dry finish. Overall: A very enjoyable, easy drinking, fruity sour ale. This shows up as the 13' bottling but I hope they're saving some of each batch to make a blend of different years in the gueuze style. Recommended to fans of lambic and all sour ales; this is definitely worth trying and cellaring. Nice smooth oaky very nice and much more involving than a typical blonde.